You care so much about the environment and choosing organic options for yourself and your family members. Did you know that you have the option to go that route with your lawn care as well? Sustainability and limiting chemical exposure to yourself, your family, and your pets are reasons why you should consider a self fertilizing lawn. Your local Norfolk lawn care professional, Distinctive Landscaping, can show you how their organic lawn care program eliminates the need for traditional chemical lawn treatment. Using fertilizers, weed killers, and insecticides around pets may not kill them, but they can make your animals sick if they get into the bags where those chemicals are stored. Some insecticides for roses have bone meal, blood meal, or fish meal mixed into them that may attract dogs. If the dog eats them, you may be saddled with a large vet bill as the animal could form a hard substance in their body near the pancreas. This will cause diarrhea and vomiting. Snail bait and rodenticides are also very dangerous if animals and children get into them. Fortunately, there are several options for treating pests without dangerous chemicals. Eco-friendly herbicides contain ingredients such as corn gluten, vinegar, plant oils, and fatty acids. It is relatively simple to make your own insecticides with materials such as liquid soap and water, red pepper, garlic powder, and onion. Another organic option is to use diatomaceous earth to dehydrate and kill crawling insects when you are practicing fertilizing lawn care. For more information on creating homemade pest control, check out Mother Earth Living. There are a few techniques that you can use on your lawn to make it self fertilizing. The first involves setting your mower blade to the correct height for your grass type, which is generally 3-4 inches. If you cut the lawn too short (known as “scalping,”) more light will reach the soil. This damages the lawn and encourages weeds to grow. Watering properly (infrequently and deeply) discourages crab grass. 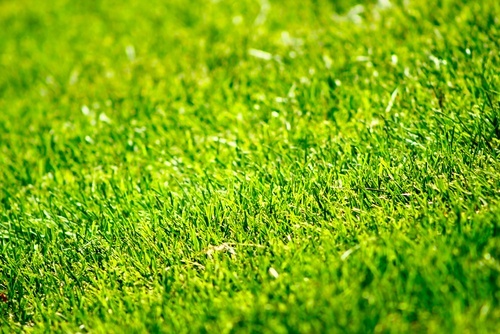 You should consider leaving grass clippings on the lawn because they are full of nutrients and nitrogen that help nourish your lawn. They can help improve the soil, especially if your lawn is low in organic materials or if it is sandy. Mowing when the lawn is dry is important as it eliminates the clumps of clippings that you may be tempted to remove. Monitoring insects, soil, and turf health and taking appropriate action will help you develop a healthy lawn. If you feel uncomfortable with taking on fertilizing lawn care yourself, then you should get advice from a landscape professional in the Norfolk area. Jason Scott, MLCP, CSP, is the President of Distinctive Landscaping, Inc. He started his business with a few customers and basic equipment in the 1990’s. Today, he holds many accreditations and certifications. The Northeast Organic Farming Association has accredited him as an organic land care provider because of his passion for sustainability. His company has a whole systems approach to their organic lawn care program. He uses cultural programs to grow healthy grass, and builds soil health to eliminate the need for synthetic pesticides. You may visit http://www.redtrucks.net/ for more information and to fill out a request for a quote.